We don’t think that it is possible to overstate the importance of this project: an electronic kit that when built, allows full control over your car’s mixtures by means of a digital hand controller. And you want to know the real clincher? The kit costs just AUD$79.95. Don’t have the electronics skills to build it? 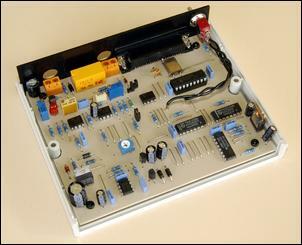 It is also available through the AutoSpeed shop, fully built and tested. If all you want to do is alter your car’s air/fuel ratio, expensive interceptors are pretty well all immediately blown out of the water. Want to change your high-load air/fuel ratio? This project can do it. Swapped in a new airflow meter or upsized the injectors? Again this project can provide the solution. If your car uses a voltage-outputting airflow meter – hotwire or vane - this interceptor will work with it. We’re talking something that is easy to tune, absolutely seamlessly transparent in driveability, and easy to wire into place. 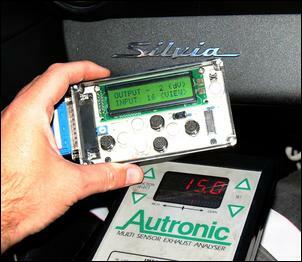 The Digital Fuel Adjuster was developed and designed by Silicon Chip electronics magazine. The kit, along with many others, is covered in the Silicon Chip publication – Performance Electronics for Cars – which is available from Silicon Chip Publications or the AutoSpeed shop. The book is a must-have for DIY modifiers. The kit for the Digital Fuel Adjuster is available from Jaycar Electronics [www.jaycar.com.au] or through the AutoSpeed shop for AUD$79.95, with the required Hand Controller kit AUD$59.95. Built and tested versions of the Digital Fuel Adjuster and Hand Controller are also available from the AutoSpeed shop. The unusual mixture of ingredients – development funding from an electronics magazine, design and development by an electronics guru with no particular interest in modifying cars, and concept development and project management by me – has resulted in something of which I am very proud. It’s a unique product that works superbly and undercuts by a huge amount similar commercial products... none of which, AFAIK, can do all that this one can, anyway! The Digital Fuel Controller (DFA) is an interceptor. It takes the voltage signal coming from the airflow meter and allows adjustment of this voltage up or down in very small steps. It interpolates between the steps (ie smooths the curve of the adjustments) and when no changes are made to the signal, the input exactly equals the output. The latter means that there are no ‘digital jumps’ that might give poor drivability. In fact, on the subject of driveability, it is brilliant – we spent over 24 months and thousands of kilometres trialling the DFA in different cars (including the ultra-smooth 1998 Lexus LS400, a 2002 Impreza WRX, an STi Impreza WRX, a Nissan S15 200SX, a 1988 Nissan Maxima V6 Turbo, a mid-Eighties BMW 735i and a 1999 Toyota Prius) and if the modified air/fuel ratios are set correctly, the drivability remains absolutely factory. Each of the 128 load points can be adjusted up or down in 127 steps, which gives a very fine range of adjustment indeed. The removable digital hand controller shows both the load point being accessed and the up/down adjustment. Tuning changes are made with pushbuttons on the hand controller – no laptop is required. It is brilliantly effective at altering mixtures, it’s available now, and it is incredibly cheap. In RUN mode the display shows which load site is being accessed by the running car, and what up/down changes have been made at that load site. 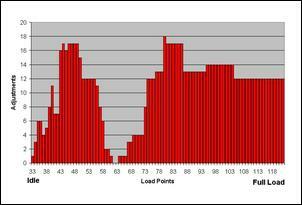 But what are these load sites all about, anyway? Typically the DFA is set up for 0-5 volt signals. In these cases, an input voltage from the airflow meter of 0 is indicated by a load site of 1 (shown on the hand controller as “INPUT 1”), and an input of 5 volts is shown as a load site of 128 (“INPUT 128”). From this it’s not too hard to work out that all the in-between signal voltages will show up as in-between load sites – for example, a signal input voltage of 2.5V will show as a load site of 64. For example, a particular airflow meter might have a minimum voltage output of 1.5V at idle and a maximum voltage output of 4.6V at full load. This means that when the car is being driven and the Hand Controller is in RUN Mode, INPUT numbers ranging from 38 to 118 will appear on the LCD. In this example you then have 80 load sites at which the airflow meter voltage can be adjusted (there’s no point in adjusting load sites below 38 or above 118, because in this case they’re never accessed). So the INPUT load sites are just another way of showing airflow meter output voltage. In RUN mode you can real-time tune each load site as you’re on it. For example, if you’ve got an assistant driving the car up a long hill and the Hand Controller is showing load site 87 (“INPUT 87”), pushing the white ‘up’ key will cause the mixtures to be immediately richened at that load site. Each time you press the white ‘up’ key, the OUTPUT number shown on the display will change upwards. This shows that at load site 87, you’ve increased the voltage output of the airflow meter by 2 units (which will cause the mixture to be richer). If you want the mixtures to change even faster, press the black ‘up’ key, which will cause the adjustment to jump up in blocks of four units. 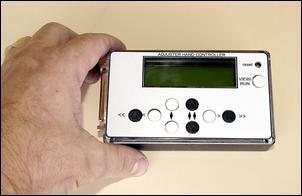 Pressing the ‘down’ buttons will reduce the airflow meter voltage at that load site, leaning the mixture at that load. The maximum adjustment is plus/minus 127 units. Tuning in real-time RUN mode can be useful but VIEW mode tuning is often used. VIEW allows you to scroll left/right through all the load sites and then make tuning adjustments. It’s easier to see what it looks like when it’s graphed. Note that unlike a programmable management system - where you’d expect the map to be more regular in shape - the resulting air/fuel ratios from the DFA interception are the outcome of both what the factory had already programmed and the changes that you want to make. For example, if you want richer mixtures in the midrange than the factory had set (eg in a turbo car as it comes on boost), there’s likely to be a hump in your tuning chart at that point. In use it’s even simpler than this explanation indicates – it takes only a few minutes for even novice tuners to get the hang of things and start tuning the air/fuel ratios. Let’s be realistic – all products and modification approaches have shortcomings. So what are the DFA’s? Firstly, it is an interceptor. All interceptors – no matter how fancy their names, initials or advertising – have negatives. The most major is that the ECU needs to be confused into doing what you want. For example, if you reduce the load signal coming from the airflow meter, the mixtures will go leaner – but the ignition timing is also likely to advance a bit. For this reason it is important that the engine be monitored for detonation when the mixtures are being altered.